The threads in normal position from the front breast beam to the back thread beam are in the center of the heddle eye and reed. When shafts one and four are pull down by the action of one or two lams and treadles, shafts two and three automatically move up, from the action of the lower rollers giving a large clean shed. Easy threading because you have to attach only the shaft you want to lower. You are always limited to 4 shafts. Nilus II helps but it is not perfect. With this type of loom, the threads (in normal position) rest at the bottom of the reed, on the shuttle race. If a treadle tied to shafts #2 and #3 is pushed down, the jacks will raise these shafts, while all the others remain in the resting position. This kind of shed can be very large or small depending on the pressure there is on the warp threads and how many threads we have. For example, it will be easer to have a nice shed with a 36" loom with 20 threads per inch than with a 60" loom with 40 threads per inch. Here you have to understand that we may have to raise half of the threads; so the more threads and tension you have the more difficult it will be to raise them. You can change from 4 to 8 shafts at any time. In some threading with 8 or more harnesses, some shafts tend to float even if they are not pushed up. It can be improved by adding springs to treadles or weight to shafts but then it will be even more difficult to raise them when needed. This system resembles the counter balance loom and has the same advantages without its disadvantages. Instead of having the rollers at the top of the harnesses, the system has one set of lams, two sets of pulleys above the shafts and one set of pulleys below. 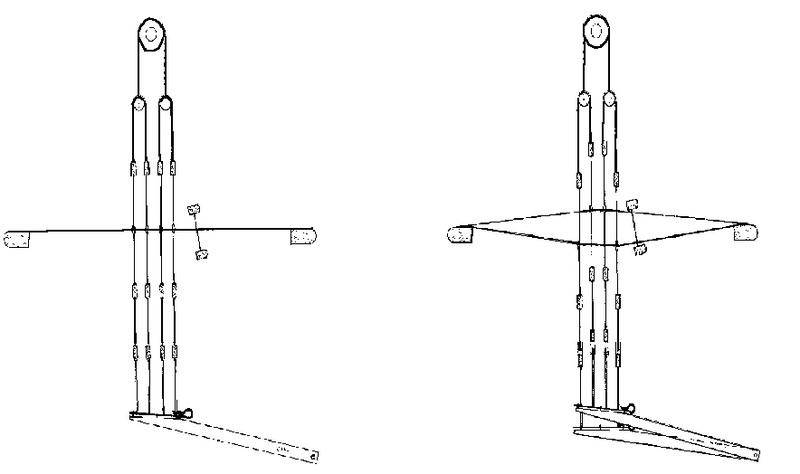 In our diagram you can see the treadle pulling down shaft #1 while the other three are lifted by the action of the lam. When the lam moves down, the cord attached to it goes around the lower pulley, then around the upper one and finally, lifted the shaft attached to it. In a countermarch loom, every shaft is actively involved in each shed: each shaft is either lifted or pulled down by each pedal. Uneven shed like 3 shafts against 1 is always large and clean . Because you actually lift or pull down every shaft, you never have any problem with one shaft lifting when it should not. every shaft to the treadles you will be working with. For a 10 treadle pattern, 80 tie-ups have to be made under the loom. - The shaft combination is limited by the number of treadles on the loom. - Sophisticated system of cables and pulleys makes it very difficult to install and keep adjusted. Since we introduced the Back hinge treadle system, Leclerc no longer recommends the countermarche system. Jack looms are known for their simplicity, versatility and ease of tie-up. With proper care a Leclerc Jack Loom will provide a lifetime of weaving enjoyment. As with all Loom designs there is some tradeoff. With the Jack Loom the most often cited was the difficulty in getting a good shed with 6+ Shaft weave construction. Our new design has overcome this problem . The new design features the Treadles anchored at the rear of the Loom, with a new, unique, Rocker mechanism that insures even tension on all Treadle Cords with the Treadles in both the rest or depressed position. This new design provides the weaver with the ease of Leg Treadling multi Shaft designs, comparable to that of a 4 shaft. In addition, we experience a wide , clean shed on all Shafts. We, at Leclerc, are very excited about this new Jack Loom Treadling concept. In our opinion, it is the best system on the market. Always provides a wide, clean shed even when weaving hight warp tension designs such as Rugs. Available in 4, 8, 12 and 16 Shaft Capacity. Looms and Kits are slightly more expensive. Treadles must be unhooked to completely the fold back of the loom. 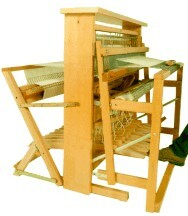 Historically, the "Nilus" model loom was the first of the two models to be introduced by Leclerc. It is a 4 shaft jack type loom upgradable to 8 shafts. 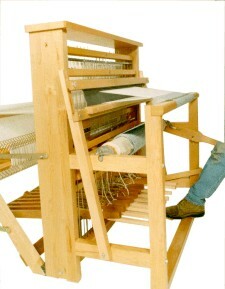 The "Nilus" loom is the smaller and more compact and is equip with 10�" heddles The "Nilus" model Loom was probably the most popular jack Loom in the world and along with the "Mira" and "Fanny" counterbalance models made up the backbone of the Leclerc market line for most of the company early growth years. In the 80's Nilus Leclerc Loom Co. decided to introduce a new model jack Loom that would have the major advantage of being able to be converted from jack to counterbalance, and back. At that time it was decided to stop production on the Nilus. In addition to being convertible, the "Nilus II" loom utilizes 12�" heddles that offer a wider shed, and is deeper providing easier Treadling on the higher tension constructions. It takes slightly more floor space. In 1998 after receiving many request from customers we reintroduced the "Nilus" model. We now offer both models in 4 and 8 shaft, jack or countermarche. Both models are also available with "Back Hinge Treadles". 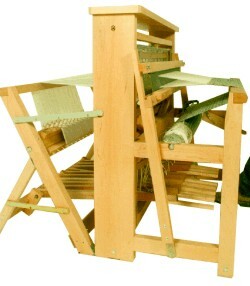 The "Nilus" model loom is especially appealing to those weavers with shorter legs.